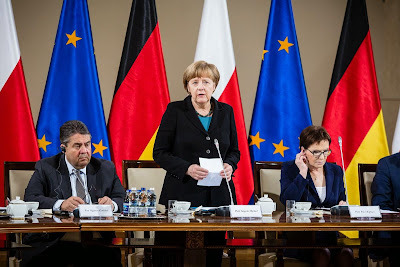 WARSAW, Poland -- German Chancellor Angela Merkel said she expects European Union sanctions against Russia to be renewed as the bloc held summit talks with Ukrainian President Petro Poroshenko. Merkel said Monday that EU members agreed in March that removal of sanctions, which expire in July, must be tied to adherence to the Minsk peace accord. Poroshenko met EU Council President Donald Tusk and European Commission head Jean-Claude Juncker in Kiev as international monitors reported a surge in fighting near Ukraine’s strategic port city of Mariupol. “It’s completely clear that fulfilling the terms of this package will take longer than August or September,” Merkel said after talks with Polish Prime Minister Ewa Kopacz in Warsaw. Ukraine, the EU and the U.S. accuse Russia of sending troops and weapons to aid separatists in the yearlong conflict that’s killed more than 6,100 people in eastern Ukraine and devastated the country’s economy. Russia rejects the allegation and has accused the government in Kiev of waging war on its own people, as a fragile cease-fire negotiated in Minsk, Belarus, in February comes under strain. The EU is determined to act if the Minsk agreement isn’t implemented and, while violence has decreased, “cease-fire violations continue on a daily basis,” Tusk told reporters after the summit talks. “On top of that, we are really concerned about information we are receiving that weapons are still entering into eastern Ukraine,” he said. 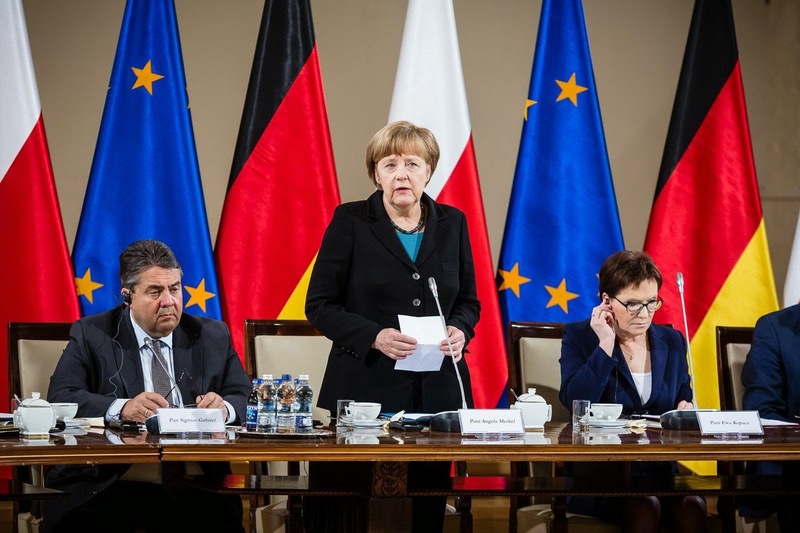 Poland and Germany agree “there’s no basis to ease sanctions against Russia,” Kopacz told reporters. There’s no alternative to a diplomatic solution to the conflict, he said, reiterating a request for peacekeepers. One soldier was killed and three were wounded in the past 24 hours, Ukrainian military spokesman Oleksandr Motuzyanyk told reporters in Kiev on Monday. Rebels are intensifying fighting in the conflict zone, “ignoring the Minsk agreements,” he said. Monitors observed “the most intense shelling” since February in Shyrokyne, near Mariupol, on Sunday, the Organization for Security and Cooperation in Europe said in an e-mailed report. A rebel advance on Mariupol would be “disastrous” for diplomatic efforts to resolve the crisis, the OSCE said Monday in a separate statement. Ukrainian troops carried out “massive firing” with artillery and tanks against rebel-held territory, the separatist-run DAN news service reported on Monday, citing the Defense Ministry of the self-declared Donetsk People’s Republic. As the conflict simmered, recession-stricken Ukraine is continuing efforts to restructure its debt. Its third-largest bank got bondholder approval on Monday to extend the maturity on $750 million of Eurobonds by three months to July 27. The vote marked the first test of Ukraine’s ability to reach new terms on 29 bonds and loans by June to qualify for the second part of its $17.5 billion International Monetary Fund bailout.